Internal memory: 4M storage is able to store 40000 point. 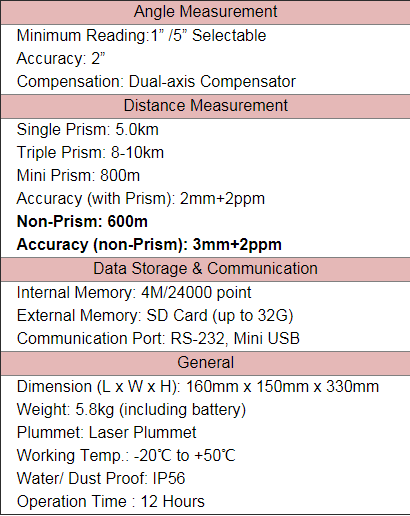 With prism 5Km~10Km. Without prism 600m (optimal). Is there any target that you can not put prism on? Now use reflectorless laser! 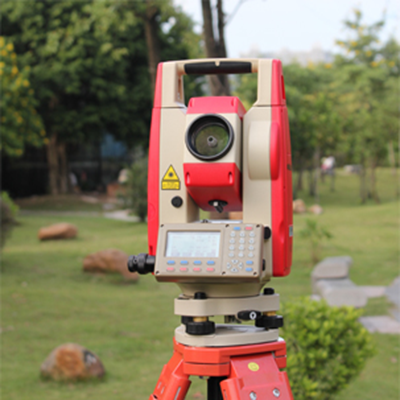 Various of surveying programs onboard: angle offset, angle repetition, dual-distance offset, 3-D coordinate measurement, remote Elevation, Missing line, staking-out, road design, area calculation, and reference line. Never to manually rotate EDM to do angle initialization. Don’t fear about suddenly power-off. Absolute encoding, absolute accurate. pcs of rechargeable batteries. Battery life can support 12 hours distance measurement or 24 hours continuously angle measurement.